The YotaPhone 2 – that phone with an e-ink display on the back – hasn't even been released properly in the US yet, but the company's execs are already teasing what's next. Managing Director for the US at YotaPhone, Matthew Kelly, told TechnoBuffalo, "We have a next-generation product lined up. We can't sell our next generation until we sell our current one. Carriers are interested, but a lot hinges on how well the YotaPhone 2 does." He confirmed the YotaPhone 3 will come with a faster processor, sharper display, a better e-ink display as well as more RAM, a powerful camera and a thinner design. 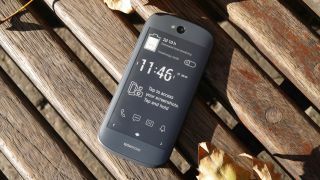 Kelly also confirmed there will be a YotaPhone 2c with a cheaper price tag but couldn't confirm any specs just yet. Kelly said, "We pumped a lot of premium specs into YotaPhone 2, but based on market feedback, a lot of people said they could do without certain features. So YotaPhone 2c is in the works if people want it." In terms of a release date it seems to be quite a long wait - we're going to have to see how the YotaPhone 2 does before any of this is certain.